I’ve just picked out the photos for my 365 on flickr. I’m missing a few days… Which is bad I know that 4 days of pics are on my Canon Compact. But the battery on that has died. The clock on my Sony Digicam was set wrong. So I may have got some on the wrong date… I seem to be missing a photo for February 22nd… 🙁 I know I took one. I started the year planning on posting all my 365 Images as I took them to my blog. I got lazy in posting them to flickr and now look at me… Apparently I’m 34 images behind… I think some of the images are on flickr but I didn’t post them because I had been hunting down on image that had gone walkies. I’m going to start a fresh and hunt down the rest of the images as I can, because there is no point in taking all these photos unless I post them so people can critique them. Photo Blog: 365: 69. The busker out my window. 365: 69. The busker out my window., originally uploaded by Ohmzar. t’s been a while since I posted a 365 I have been taking them. I just haven’t had a chance to post hem to Flickr. 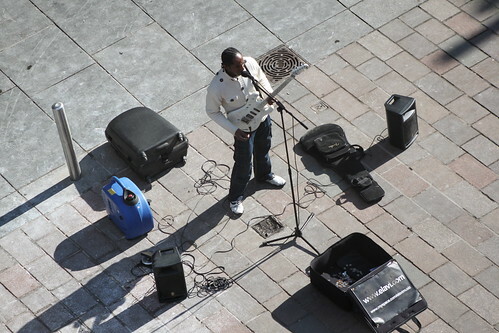 This is a guy who is apparently called Elavi(Yes I did some research and got a link to his website, the address is on his bag), he is rapping and playing the bass outside of my window. Oh 365 Where art thou? Just thought I’d posta quick blog about my 365. I so far managed to take at least one picture a day for the past 41 days, not counting today (Technically I have taken a photo today but it was with my phone). I’m enjoying the experience but it is stressfull having to make sure I always have my camera on me, and there have been a couple of days where I’ve taken a photo at 11pm just so I have a photo for that day. I’ve had a timestamp issue on some of my photo’s because my camera was still set to Saudi time so some of my 365 pictures look like they were taken the day after they were taken. I think i deleted the photo from this Monday which is a bit rubbish… I may have copied it to a hard drive, but I’m not sure. Inspiration seems to come in bursts, some days I’ll have 20 images that I want to use for my 365 others I’ll struggle to get one that I like, or even to take one photo. On the whole I am learning though which is what is important. Tuesdays in particular are a difficult day because I follow the same routine every tuesday and I’m finding it difficult to be inspired. It’s also a bit rubbish that it’s dark when I leave the office, but cest la vie. I think I need to get a better bag for lugging my camera about, I’m finding that having the camera in my backpack is frustrating as I have to take the bag off and pull out the camera whenever I want to take a photo, by which point the moment is lost or the subject has moved. Next week is going to be interesting as I’m lending my DSLR to a friend. I’ll have to use a point and shoot camera again. I’m taking this as a reason to focus on composition rather than funky aperture/depth of field/ exposure stuff, who knows. I’ve got 7 images that need to be posted to my 365 set/blog. I think some of them are already on flickr I’ve just not added them to the set. Author OmarPosted on February 12, 2010 Categories 365, Blog, Photography1 Comment on Oh 365 Where art thou? I took this photo of one of the lanterns we have on the wall. Close up using a nifty fifty lens and at full aperture (1.8). I like it I tried as hard as I could to blur out the wire that was powering the lantern, mostly succeeded. I’d seen another photo online of a bunch of scrabble tiles, so I took this. Again experimenting with tilt shift. This is a tilt shifted photo of my desk. Nothing special, just needed to take a photo and was messing around with tilt shift photography. Photo Blog: 365: 32. Joy! Annabel got her belated birthday present. She wasn’t expecting it to be what it was. I wanted to take a portrait of Annabel, she’d complained that all my photo’s were artsy and didn’y have any people in them so I took this one. Needed to take a photo of and Annabel looked quite cute and sleepy so took this photo.